Vitis mustangensis, commonly known as the mustang grape, is a species of grape that is native to the southern United States. 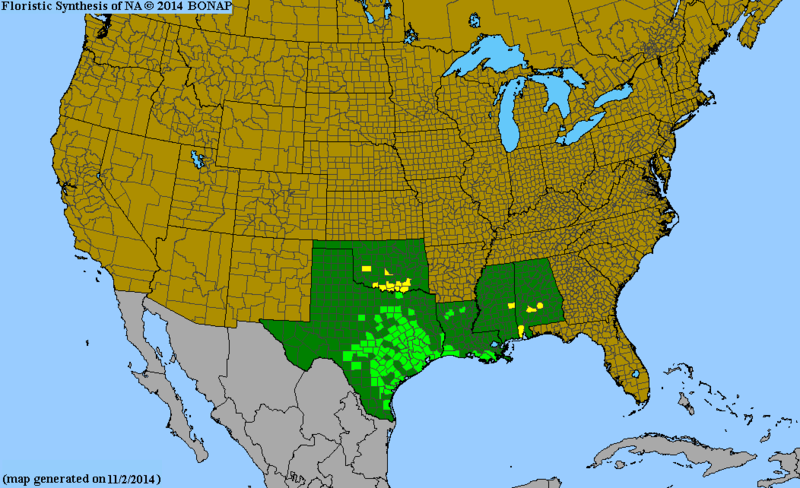 Its range includes parts of Mississippi, Alabama, Louisiana, Texas, and Oklahoma. This woody species produces small clusters of hard green fruit that ripen into soft 3⁄4-inch (2 cm) dark purple berries in August–September. They have a thick outer layer of flesh and on average contain four seeds. This variety of grape is recognized by the white velvet-like underside of the leaves, and often covers small trees, shrubs, fences and other objects that it grows near. V. mustangensis is dioecious, with only female vines bearing fruit. The fruit can be potentially irritating to the skin when picked or eaten, and are mildly unpleasant to eat because of bitterness and high acidity content. The grape has a culinary use as jelly and grape juice, both of which are typically sweetened with sugar so as to be palatable. They can also be baked into cobblers, as some early cookbooks in the region directed. Mustang grapes have also been used to make mustang wine since before the Civil War. The fruit and leaves of Mustang Grapes may also be used to dye wool. ^ a b "Vitis mustangensis". Germplasm Resources Information Network (GRIN). Agricultural Research Service (ARS), United States Department of Agriculture (USDA). Retrieved 2010-12-07. ^ Lynch, Daniel. Native and Naturalized Woody Plants of Austin and the Hill Country. Saint Edward's University, 1981, p. 95. ^ a b "Wild Harvest: Texas' Bounty of Native Fruits|| TPW magazine|August/September 2013". tpwmagazine.com. Retrieved 2019-03-06. ^ Tull, Delena. Edible and Useful Plants of Texas and the Southwest: A Practical Guide. University of Texas Press, 1987, p. 206-208.